In the midst of human-induced global climate change, powerful industrialized nations and rapidly industrializing nations are still heavily dependent on fossil fuels. Even if we arrive at a Hubbert’s peak for oil extraction in the 21st century, the availability of technologically recoverable coal and natural gas will mean that fossil fuels continue to be burned for many years to come, and our civilization will have to deal with the consequences far into the future. Climate change will not discriminate between rich and poor nations, and yet the UN-driven process of negotiating a global climate governance regime has hit serious roadblocks. This book takes a trans-disciplinary perspective to identify the causes of failure in developing an international climate policy regime and lays out a roadmap for developing a post-Kyoto (post-2012) climate governance regime in the light of lessons learned from the Kyoto phase. Three critical policy analytical lenses are used to evaluate the inherent complexity of designing post-Kyoto climate policy: the politics of scale; the politics of ideology; and the politics of knowledge. The politics of scale lens focuses on the theme of temporal and spatial discounting observed in human societies and how it impacts the allocation of environmental commons and natural resources across space and time. The politics of ideology lens focuses on the themes of risk and uncertainty perception in complex, pluralistic human societies. 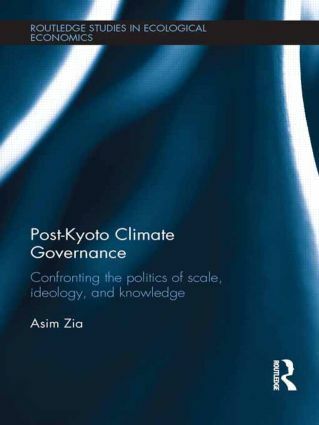 The politics of knowledge lens focuses on the themes of knowledge and power dynamics in terms of governance and policy designs, such as marketization of climate governance observed in the Kyoto institutional regime.